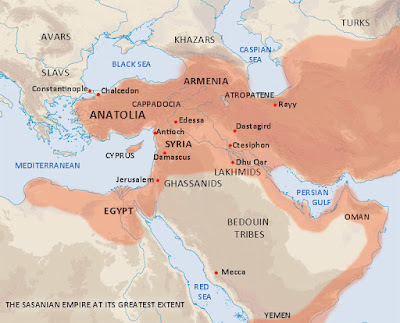 The Sassanids had already captured Roman Syria and Palestine in 614. 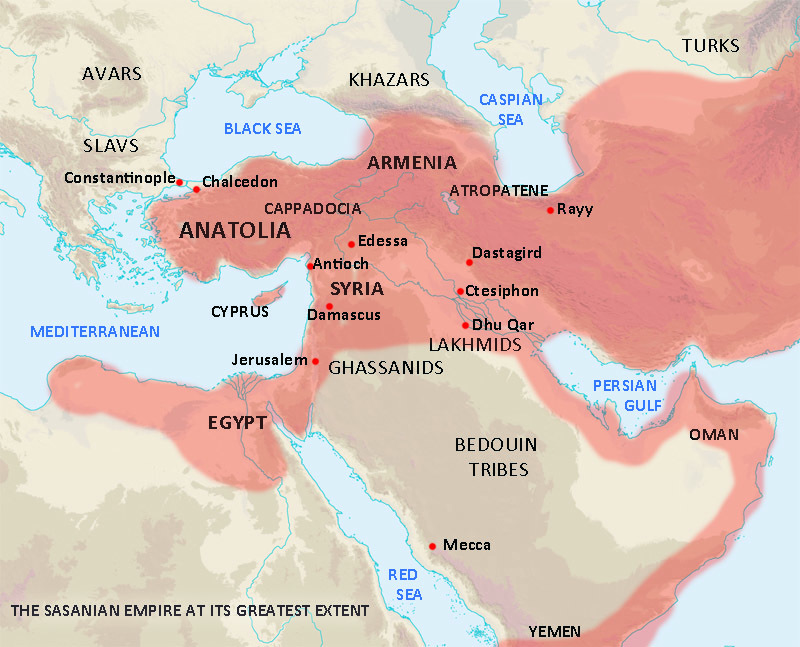 According to the Chronicon Paschale, in 615, during the ongoing war with the Roman Empire, the Sassanid Persian army under spahbod Shahin invaded Asia Minor and reached Chalcedon, across the Bosporus from Constantinople. It was at this point, according to the Armenian historian Sebeos, that Emperor Heraclius had agreed to stand down and was about ready to become a client of the Sasanian emperor Khosrow II, allowing the Roman Empire to become a Persian client state, as well as even allow Khosrow II to choose the emperor. At Chalcedon, Shahin agreed to conduct a Roman embassy under the praetorian prefect and patrician Olympios to Khosrow to pursue peace. With Olympios were Leontios a patrician and city prefect, and Anastasios a presbyter of the Church of Hagia Sophia. Olympios delivered a letter to Khosrow from the Roman Senate and people expressing the submission of Emperor Heraclius to the overlordship of Khosrow. By now the Persians were in a position to dictate their terms, and had reason to fear overreaching themselves if they pursued the war. So confident, however, was Khosrow of further victories in seizing the entire Roman empire for himself, that he kept the ambassadors imprisoned and let them die in captivity. There Olympios died confessing his Christian faith and refusing to worship the sun. As it turned out, though the peace initiatives failed, there was no attack on Constantinople in 615 because Khosrow's armies were diverted to invade Egypt, which had greater economic value than battered and besieged Constantinople, and it was much easier to conquer.